The Bicycle Oblivion deck features the world class Linen Finish for superb handling and unparalleled durability. This deck is available in a killer red or white back design. It features original art beautifully designed custom court cards, Aces, Jokers and pips that will cause double takes! Included in the deck is a bonus blank faced Oblivion card and a Joker with two clever reveals. 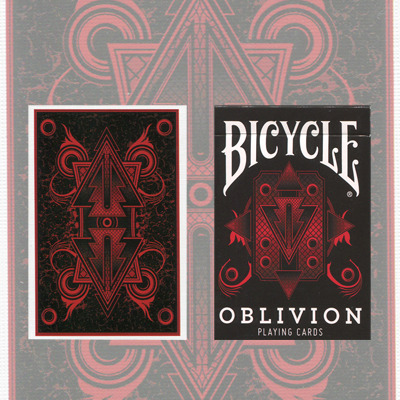 The Oblivion Playing Cards designed by Dave Behm. Printed by the United States Playing Card company, this Bicycle deck is bound to be a true collectable.